The basic functions of the combined inverter of the Steca Xtender series are the inverter, the battery charger, the switching function and the support of external sources of alternating current. These functions can be combined and controlled fully automatically, the range offers outstanding user-friendliness and very good exploitation of the energy available. All the settings of the Steca Xtender XTH can be remote controlled. When a software with new functions is available, it can be loaded into the system, so the Steca Xtender XTH always stays up to date. Several Steca Xtender XTH can be connected in parallel or to form a three-phase system. That means that up to nine Steca Xtender XTH can work together. These potential-free contacts can be programmed for many different applications. They can react to any event outside or inside of the inverter (grid availability, battery voltage, fault message ...) They can also be programmed on a timer or can be switched on during particular times (at night, at the weekend ...). In this way, they can serve to start up a generator, to switch off less important loads, to signal a fault, to charge batteries depending on the situation, etc. With the smart-boost function, the output of another source of alternating current, such as a power generator or a land connection, can be increased; even when special loads are being used (inductive, asymmetric, with high switch-on current). 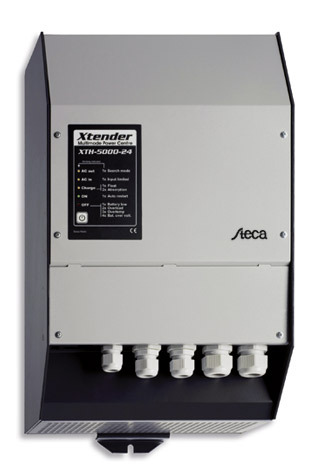 It is also possible to combine the Steca Xtender XTH with almost all inverters which are already present in order to increase the available output.